Retain customer relationships, create lasting bonds with the next generation, show your clients they really matter. Offer a relevant service to your clients not previously available. Connect with the next generation of clients. Your client’s dashboard will appear similar to the individual’s dashboard but will be Co-branded with your business details. Clients will have your support with their Life in Cache plan which will compliment any other business areas you may offer. Business Administrators can purchase plans and distribute them to their selected business Account Managers. Administrators also have the same customer control rights as a business Account Manager allowing them to assist clients directly. 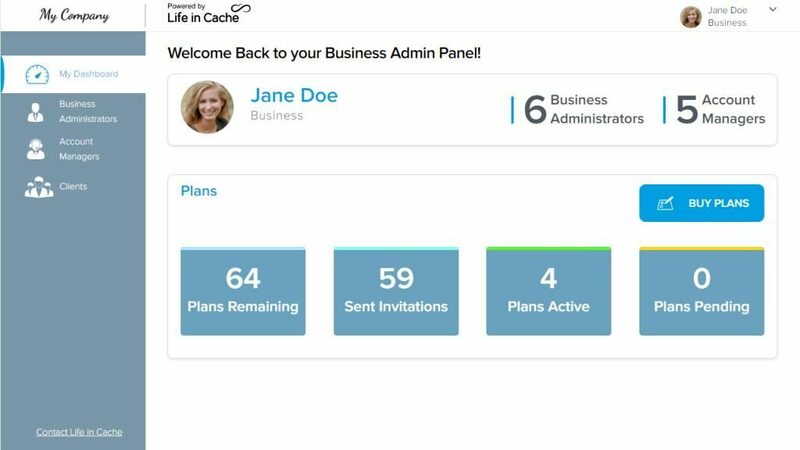 Account Managers can distribute plans to clients via their Life in Cache business panel. Account managers can also assist clients with data input and management of their life plan. The Life in Cache dashboard allows you and your clients; provided they have allowed you access, to view and add to their life plan. This dashboard has the same functionality as the individual account but allows you to help your clients input their data if they require assistance.